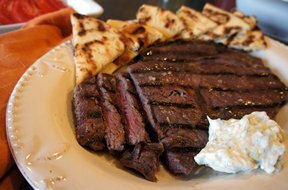 "Just got a new grill and this recipe for steaks was an easy one so I thought I ... read full review"
Twenty minutes before grilling, remove the steaks from the refrigerator and let sit, covered, at room temperature. Heat your trill to high. Brush the steaks on both sides with oil and season liberally with salt and pepper. Place the steaks on the grill and let cook until golden brown and slightly charred, 4 - 5 minute4s. Turn the steaks over and continue grilling for 5 to 6 minutes for medium-rare (an internal temperature of 135 degrees F), 7 to 8 minutes for medium (140 degrees F), or 9 to 10 minutes for medium-well (150 degrees F). 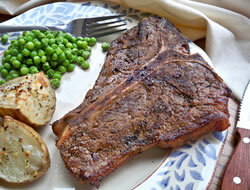 Remove the steaks to a cutting board or platter, tent loosely with foil, and let rest for 5 minutes before serving. 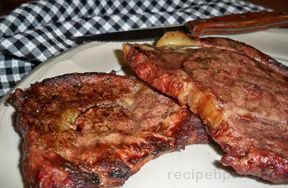 "Just got a new grill and this recipe for steaks was an easy one so I thought I would try it. 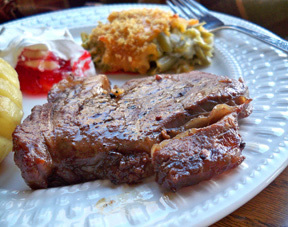 I used the suggested grilling times stated in the recipe and they turned out great."